A visit to the hand-soap aisle of any store tells the story of an ever-increasing trend towards cleanliness. Anti-bacterial soaps and hand-sanitizers reign supreme and our fear of all things dirty can lead us to clean our babies’ pacifiers every time we put them in their mouths, keep our kids away from dirt at the park, and constantly wipe their faces and hands while they eat. While we are fans of germs (the good, immunity-building ones) and getting dirty at the park, we’ll leave those topics to other experts and focus on what we know for sure: If you allow your baby or toddler to feed herself (and the inevitable mess that ensues), you’re contributing to her optimal development, physical health, and lifelong healthy eating habits. 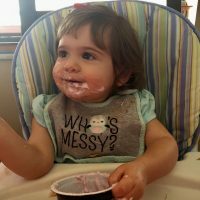 Why is it important to let my baby or toddler feed herself (and get messy while doing it!)? Develops fine motor skills. When your baby is ready for finger foods (when she starts crawling), placing them on her tray or plate encourages her to pick them up with her thumb and first fingers, which is known as the pincer grasp. This fine motor skill is the building block of countless other skills, beginning with holding utensils, crayons, and pencils. Nurtures speech development. Eating uses the same oral-motor skills as speaking. When your baby or toddler is biting, chewing and swallowing, she’s strengthening the oral-motor movements required for speech. Messy eating and happy eating tend to go together, and happy eating gives her lots of time to strengthen those oral-motor movements. Encourages curious eating. We say let your baby smush food between her fingers, get it on her face, and rub it around her tray or plate. If she wants to use a cracker instead of a spoon to scoop something up, or if she wants to use the wrong end of spoon, let her go for it! All of this sends the message that eating is a pleasurable experience, and she will be more likely to try different foods. Allows baby to control the amount of food she eats, and the speed at which she eats it. Instilling, from a very young age, the habit of eating at your own pace and stopping eating when you’re full decreases the risk of developing health problems like obesity, diabetes, and even eating disorders. Leads to a healthy relationship with food. Food is the ultimate educational toy! When you give your toddler a sandwich and allow her to take it apart, squeeze the bread, or stretch the melted cheese, she will learn the art of enjoying food. This enjoyment, paired with her habit of controlling the amount and speed of eating, will set her up for a healthy relationship with food. Opens the door to optimal nutrition. Both playing with food and controlling how she eats it sends your child the message that trying different foods is not only fun, but that she can stop eating it if she wants to. This encourages her to try a variety of foods, and decreases the likelihood that she will develop picky eating, food aversions, or other feeding problems. We get it that it can be hard to watch your child smear oatmeal all over her pajamas, cover her face with spaghetti sauce, and drop dozens of peas of the floor. To make clean-up easier, try spreading a sheet under your baby’s chair and letting her eat in just a diaper. Then you can put the sheet in the wash and your baby in the tub. The important thing is that while your baby is eating, put the wipe down! There is plenty of time to teach her table manners, and the extra time you spend cleaning up now will pay off when she is older and an enthusiastic, healthy eater.